With the recent hot weather, the risk of Haemonchus Contortus in livestock has dramatically increased and quite a few outbreaks have been seen nationwide over the past couple of weeks. The possibility of haemonchosis in grazing sheep, goats, camelids and calves could increase further after heavy rains as this parasite is able to survive in warmer temperatures. With this is mind we would like to remind our clients about the parasite, the clinical signs of infection, responsible treatment and the best way to control it. This worm lives in the abomasum of its host and consumes large amount of blood (5000 Haemonchus can drink 250ml of blood daily!) with each female worm capable of producing up to 10,000 eggs per day. Warm and wet conditions favour the rapid development of eggs to L3 and pastures can become highly infective very quickly almost any time between mid-spring and late autumn, causing serious, unexpected outbreaks. They have poor over-winter survival of Haemonchus eggs and larvae on pasture under cold conditions but hypobiosis (suspended state inside the gut wall of the host) is the principle way H. contortus survives the winter in the UK. The endoparasite can affect both adult and juvenile ruminants with ewe deaths over summer causing high suspicion of flock infection. H. contortus is a species reported to have a marked ability to develop anthelmintic resistance. Chronic infections are characterized by failure to thrive, weight loss, lethargy and weakness. This is more commonly the case in cattle especially when mixed with other worm infections. Haemonchus Contortus cannot be diagnosed on worm egg counts but a high worm egg count can cause suspicion – counts of over 10,000epg are not uncommon. There is however a way to differentiate Haemonchus species eggs from those of other Trichostrongylid nematodes in faecal samples without larval differentiation by application of a fluorescent stain at the lab by special request. 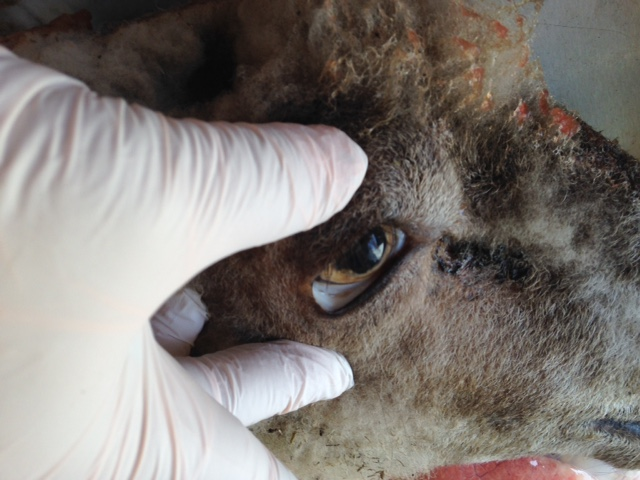 FAMACHA test – Sheep/goats are selected for treatment based on the degree of anaemia they are displaying in their mucous membranes (ocular). The degree of anaemia is assessed through a colour guided chart. Haemonchus can easily been seen in the abomasum on post mortem by your vet in animals that have recently died. Treatment options should be discussed with your vets if you suspect you have a haemonchosis outbreak on your farm to ensure the correct action is taken. Products containing both Nitroxynil and Closantal are active against Haemonchus and some stages of liver fluke but not other internal parasites. These are sensible choices for the treatment of ewes/rams to prevent promoting unnecessary resistance in other worm species to the other wormers more commonly used e.g. Ivermectin. In lambs that have concurrent infections with other worm species then the Haemonchus can be treated with yellow and clear category wormers. 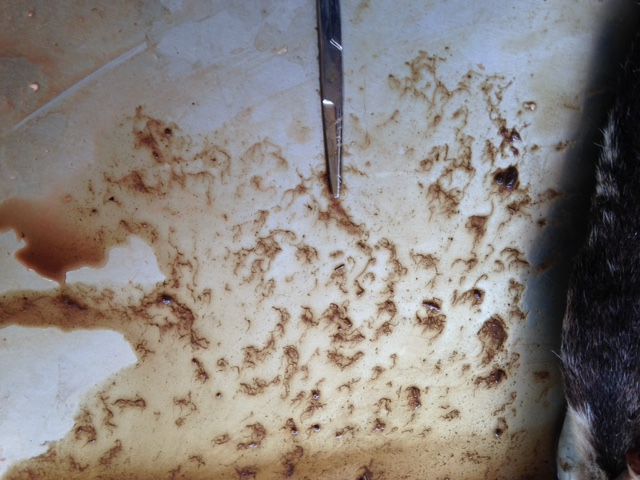 There is a fair amount of resistance to these wormers from all species including Haemonchus and so knowing the resistance status on your farm is very helpful in decision making. The best thing to do is to do a post-dosing faecal egg counts (‘Drench Tests’) after treatment to ensure the treatment has worked and detect any resistance. This involves taking samples from the same animals 7 days after treatment for yellow and 14 days after for clear treatments. Goats are as above with double dose of clear category wormers and one and a half times the dose for levamisole. If Haemonchus problems have been diagnosed then cattle can be treated with any anthelmintics containing the following active ingredient – Nitroxynil, Closantel, Levamisole (yellow) and Ivermectin (clear). If Haemonchus is confirmed in alpacas then the best treatment is double the sheep dose of moxidectin. Future control should be developed into a comprehensive and individual parasite plan developed by yourself and your vet that is reviewed year on year. If you have any questions at all about Haemonchus Contortus in your animals, you suspect you may have a case or you would like to develop a parasite plan – please do not hesitate to give your vet a call to discuss the options.